Because of their 2016 draft class, the Dallas Cowboys have aligned their roster in a strategic position over the last three seasons. And it all starts with their quarterback-running back duo of Dak Prescott and Ezekiel Elliott. How much does Dak Prescott make? Prescott, who is set to make $2,045,000 this season as a quarterback, has allowed the Cowboys to do basically anything they want with the rest of their roster. To show how much value Dallas is getting from its QB position, about 20 signal-callers are set to make at least $15 million in 2019, while eight of them are set to make at least $20 million. How much does Ezekiel Elliott make? 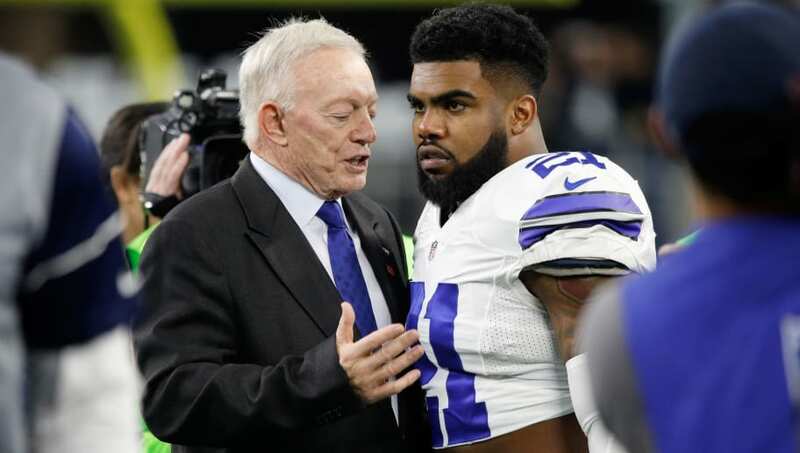 Elliott, a former fourth-overall pick in the same draft as Prescott, is set to make $3,853,137 in 2019. All Elliott has done since entering the NFL is accumulate two rushing titles, two Pro Bowl appearances and one First-team All-Pro selection in three seasons. Right there alone, with Prescott and Elliott, the Cowboys have been getting incredible production at a great discount. But Dallas is well aware of the problem staring it right in the face – the upcoming payday for those players. Prescott has already mentioned he won't be taking a Tom Brady-like hometown discount. He doesn't have Gisele Bundchen adding $400 million to his household. Amari Cooper - 5 years $85 million ($17 per year) with $52.7 mil guaranteed. Not only do the Cowboys have Dak and Zeke to worry about, but Amari Cooper and DeMarcus Lawrence are set for big paydays. Lawrence is a free agent this offseason. Cooper will be next year. Cooper single-handedly won two games for Dallas this season after being acquired in a mid-season trade with the Oakland Raiders. Lawrence, who has been a major part in the revival of the Cowboys' defense, will also be commanding top-dollar. They say everything is bigger in Texas, but unfortunately, that only applies to the demand for money here.